Androphagous plays old school grind with some metallic influences .You will get high speed drums, fast guitar riffs and deep and screaming vocals!!! 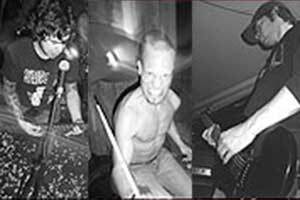 The Band was formed in the spring of 1998 in the 4 piece lineup : Christian vocals/bass martin - guitar/vocals, Nicolai guitar/vocals and Tim drums. In 1999 they recorded their first CD Blood Soaked Freaks!" on Goulash rec. and 2 years later the split tape with Tremdendous Terror on Obliteration rec. After this Martin quit the Band and went into the Jungle in Venezuela but the band continues and started to recording a new split cd with Toxic Revolution on FDA REKOTZ, which is actually released.